If you’ve ever played NetHack on Ubuntu or played the telnet version hosted on nethack.alt.org, you will have noticed that it is a bit more colourful than the version you can download for Windows on the official site. For example, in your inventory, blessed items are coloured green while cursed ones are red. Also, your health changes colour depending on how low it is. These extra features are implemented as patches that are applied to the source code, which is then recompiled. There is a large repository of source code patches for NetHack at http://bilious.homelinux.org/. As far as I can tell, the patches used by nethack.alt.org are Color HP Monitor v1.0 and Menucolors v1.5. Don’t want to mess around with the source? Then you’re in luck! Below you can download a ready-to-play version of NetHack that has Menucolors v1.5 and Statuscolors 1.2 applied. I decided to use Statuscolors instead of Color HP Monitor because as well as health, Statuscolors also allows you to apply colours to your character’s various status messages, such as Burdened, Weak and Blind. 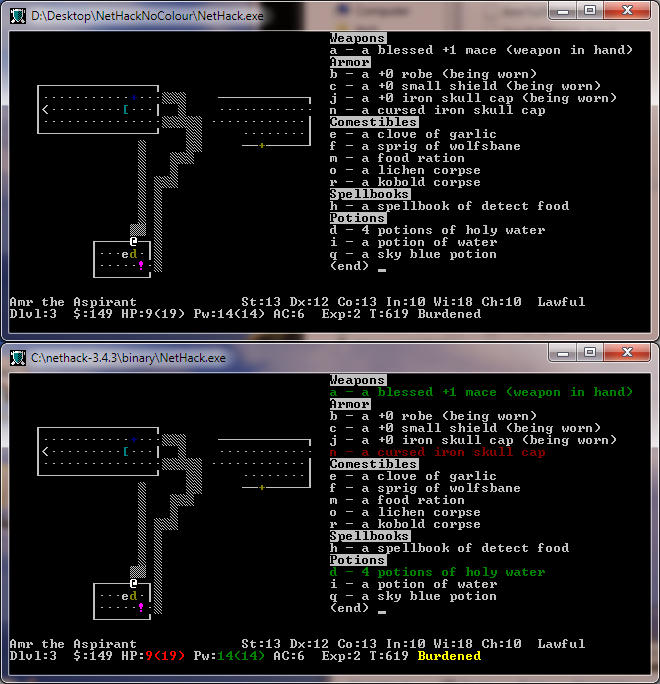 Below is a screenshot showing the same game in the unmodified NetHack (above) and with the patched NetHack (below). Instructions for patching and compiling NetHack yourself can be found on the NetHack Wiki. As new versions of NetHack are released, I will aim to apply the same patches and post them here. The patch database is nowadays at http://bilious.alt.org/ and http://nethackwiki.com/ is more active than the wikia one.